Microsoft Office Specialist is the only Microsoft certification program designed to assist employees in validating their Microsoft Office system skills. The Microsoft Office System desktop programs include Microsoft Word, Excel, PowerPoint®, Outlook®, Access and Project. Become a Microsoft Office Specialist and prove that you have the Microsoft technology skills and know how that businesses need! Have you ever tried to make a big change in your personal life or career and found yourself going around in circles? You start out in a direction you think you want to go, take a few tentative steps in that direction, and then notice that the path in front of you is getting murky? Things you try to do begin to feel "harder" and you lose energy. You start thinking, "What happened to my creativity? What happened to my energy and commitment? Am I just getting lazy?" Please send your news, updates and announcements to WITI Savvy's editor, Sara Fiedelholtz, at [email protected]. 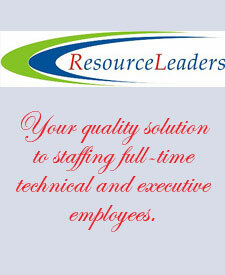 Resource Leaders specializes in staffing Information Technology and other corporate functional resources. We source Senior Managers, Program/Project Managers, Business Analysts, Technology Architects and Software Programmers. We also source for staff functions like Human Resources and Corporate support. WITI is pleased to offer you convenient savings at over 1,000 quality merchants through our partnership with CareClicks.com. Save time, money and support The WITI Foundation with this one stop shopping experience. There is no cost to join, no personal information is needed, it's safe and secure AND a percentage of your purchase supports the WITI Foundation. The amount of contribution is listed right on your screen and by starting your online shopping with WITI, some merchants offer special deals just for you. Check it out at: www.witi.com/mall. Atlanta WITI Chapter Re-Launch Event!